I’ve been hearing sporadic explosion sounds all over my workshop, seemingly at random. Even where no machines work at the time. Haven’t found any consequences. Any thoughts? Well, find out where they come from, because your are voiding Energy. Be glad I disabled Explosions from Overcharging Machines. But I’m not overcharging machines, nor am I supplying too little energy for the recipes. There is only one place that could happen, but the sounds come from other places. I’ll let you know if I find anything. Is it moonstone? Sometimes I get moonstone. 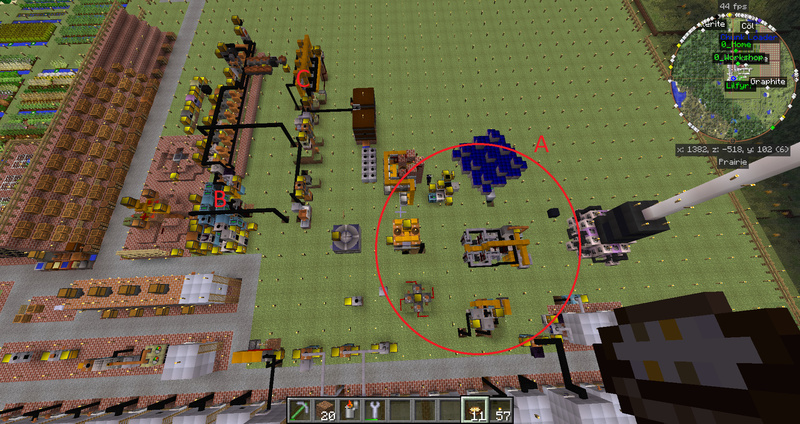 You can use sonic glasses from Openblocks mod to detect source of explosions. Unlike most other mineral ores which can be found by mining into the depths of the underground, Moonstone ore is found when a Moonstone Meteor strikes the surface at night. These moonstone meteors create small, almost unnoticable craters upon collision with the ground, along with a sudden explosion sound which may be heard more than 100 blocks away. OK @ungol if you’re still getting random explosions how about some screenshots of your setup, maybe we can suss out an incompatible setup or the like. I haven’t played in a bit, I’ll post some next time. Maybe I’ll give openblocks a shot. EDIT: couldn’t reply, so I edited this post. Allright… I’m not sure what to screencap, so here’s a bird’s-eye view of the place for now. What’s weird is that there’s two of us and often only one of us hears the explosion. I can’t guarantee, however, that that’s not human error. So today we turned off everything around area A, yet still heard explosions originating somewhere around there. We even covered the solar panels with dirt. In general, though, we hear explosions coming from elsewhere, too. Like… maybe B and C.
We also have a basement, but that’s just fluid pipes. Is it an actual explosion sound effect like you would get from TNT or another loud sound, like a clunk or click or something? Just to narrow down what could be producing the sound. Additionally: On average explosion sound effects can be heard quite far from the source and your designs being close together could make it difficult to suss out what’s really making the sound. Doesn’t Opis have a thing that shows you where sounds are coming from? Perhaps, and this is only a suggestion, but perhaps there is a cave of angry creepers nearby?